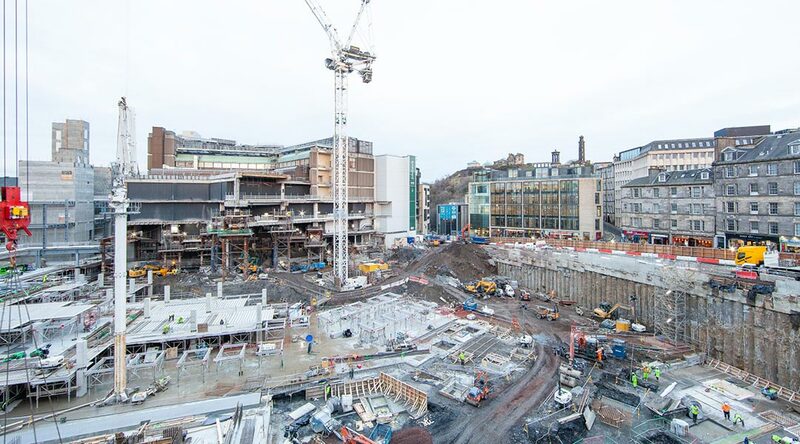 Edinburgh St James, the 1.7 million sq ft development, which is one of the largest and most significant regeneration projects currently underway in the UK, is celebrating a key milestone in its construction programme. Now over two years into development, the scheme has already reached multiple ambitious targets as set out by contractor Laing O’Rourke as part of the project’s sustainability plan. Located within a World Heritage site in the heart of Edinburgh, the project will completely redefine mixed-use regeneration in the UK. Injecting over £1 billion of investment into the city, it will feature 850,000 sq ft of retail and leisure space, including 85 new shops, over 30 new restaurants, Edinburgh’s first Everyman Cinema, 152 apartments, a striking 12-storey hotel - W Edinburgh, a 75 room Roomzzz Aparthotel, and three new public squares. With its 24 hour leisure offering, Edinburgh St James is set to revolutionise and regenerate the city’s East End. Edinburgh St James is demonstrating best practice in sustainability as part of the project’s ongoing commitment to the wider Edinburgh community, economy and environment. The development will provide long-term benefits to Edinburgh delivering over 3,000 permanent full time jobs in a variety of sectors. Up to 5,000 construction jobs are being created during the build. ‘FUSE’ the citywide retail and hospitality skills academy established to drive world class customer care experience in Edinburgh, is delivered together with the City of Edinburgh Council and the Scottish Government is scheduled to launch to the public in early 2019. The retail and leisure element at Edinburgh St James is anticipated to complete in 2020, followed by full scheme completion in 2021.